God's Word describes the body of believers as “brothers and sisters” and “co-heirs” with Jesus, and when Jesus taught His disciples to pray, He began by saying, “Our Father.” Why? We're a family in Christ. And like any family, God’s family is filled with people in all stages of spiritual development: newborn believers, those still adolescent in their walk, and the spiritually mature. Join Chuck Swindoll in this series, Growing Up in God's Family, as he takes an in-depth look at the stages of growth that characterize the Christian walk. There is one common analogy used throughout the New Testament regarding the local church. It is not a business, farm, team, school, or hospital, though those word pictures are frequently used by us to convey various dimensions of congregational life. The most often used analogy is that of a family. God is our Father; we are called His offspring—sons and daughters, brothers and sisters, even fellow heirs. Infancy is back-to-basics time! It is during that era that we set the cornerstone and fix in place the initial blocks, upon which we develop the balance of our lives, spiritually speaking. Because of the essential nature of these truths, it is helpful for us to return to them periodically and be reminded of their importance. Few things are more foundational to a productive life than walking. That is not only true in the physical realm but especially so in the spiritual realm. However, the tragedy is apparent: many in God's family (dare we say most?) have little or no knowledge of the way to do it. Let's dispel the ignorance and remove confusion regarding the manner in which God's children are to walk. There is a well-worn path stretching across every adult's life. It is impossible to grow up without travelling down that path. That path is the path of childhood. What is true physically is equally true spiritually. 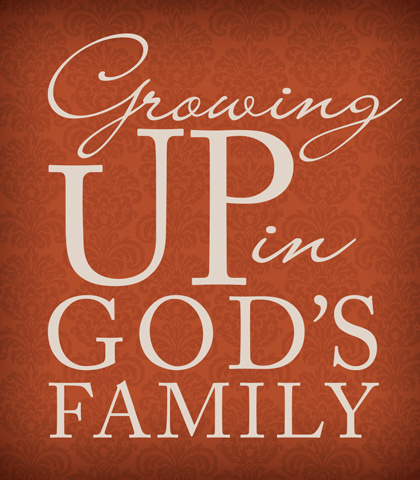 How essential is a healthy, happy childhood in the family of God…yet how rare! Adult Talk about "Childish Things"
Which “childish things” have no business lingering once we become mature? Believe it or not, God's expectation that we grow spiritually is firmly rooted in the Old Testament, where the prophets of old laid down a clear path for knowing God deeply. One of the most remarkable eras in the history of the church occurred during the first century. Shortly after Christ had left the earth, His disciples (who became apostles) led congregations into new and exciting vistas of faith. Though young and relatively inexperienced, the believers who comprised the first-century church showed evident marks of maturity…the children were now growing into adolescence! If we are not careful we could easily get the impression that adolescence is a disease with headaches and heartaches, pressure and pain as its only symptoms. Not so! Adjustments and struggles may be present, but not to the exclusion of tremendous growth and remarkable achievements. These can be some of the most exciting years of one's spiritual pilgrimage. Although most of the stories revolving around David's experiences are fairly familiar to us today, this one may not be. Because it holds within it several truths that illustrate the marks of maturity in a believer's life, it seems fitting that we blow the dust off this ancient account and consider its value in our lives today. As we think it through and relive its scenes, let's not miss its message to we who are pressing on to maturity. Out of the rich book of Psalms, we find an ancient hymn—a prayer, a passionate petition—in which David makes a series of requests and statements that reveal a level of maturity admired by all. For a few moments, read over and meditate on Psalm 26. Observe the composer's major theme as well as his unguarded admissions. See if you can discover for yourself the relevance of this melodic revelation.